Lots of convenience  low costs. With its new COMpact 3000 series for home office, small businesses and private homes, Auerswald shows that a small PBX system can be both versatile and powerful. The installation of a COMpact 3000 is a childs play to begin with. Clearly arranged and easy to access plugs allow a quick and simple installation and set-up of the system via Plug & Phone whereas the individual configuration is made easily using the web interface on a computer. A small system for all your demands. Even in their basic configuration, four analog extensions, one system telephone directory for up to 400 entries, a central voicemail and fax system with an automatic notification function via e-mail, RSS feed and call are impressive. The integrated CTI support allowing you to call your clients, customers or friends directly out of Microsoft OutLook, the connection possibility for USB printer, SD card or USB memory stick are included as well as a LAN port for the integration into an existing network. The state-of-the-art PCB design and smart energy management function ensure its power consumption is always kept at a minimum  protecting our environment and saving you money! When requirements are growing these systems show how big they really are. Design your own system! If you need two additional analog extensions, an ISDN port for system or ISDN telephones or an ISDN trunk line, simply expand your COMpact 3000 with a COMpact 2a/b, COMpact S0 or COMpact ISDN module (se tilbehør). And thats not all: two additional VoIP channels are easily activated with a release code, which you can use flexibly for external internet telephony or for internal IP telephony. Via your DSL connection you can make worldwide phone calls to other VoIP subscribers for free* or you can use your home network for the connection of an IP convenience phone like our system telephone COMfortel VoIP 2500 AB. The COMpact 3000 VoIP offers 2 VoIP channels already in its basic setup. COMpact 3000 analog, ISDN or VoIP? 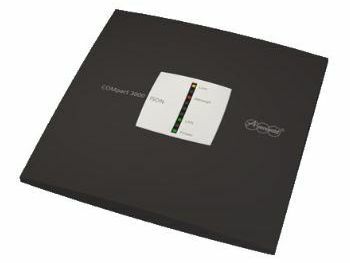 COMpact 3000 analog and ISDN differ only by their trunk lines, the classical analog or ISDN connection. The COMpact 3000 VoIP has been developed for IP telephony. Additionally this system can be used as remote PBX but as well as VoIP gateway or media converter for existing telephone systems. Either way: a perfect solution. Can be operated with an alternative firmware for the realisation of individual demands and functions*. On www.askozia.com (http://2.askozia.com/products-auerswald-compact3000) a ready-to-use firmware image of the AskoziaPBX, based on Asterisk, is available for free download (Open Source).